India is a land that promotes unity in diversity. There are several cultures and each and every culture represents a separate way of living. Apart from the language, food, customs and traditions, what sets the main difference between all the cultures is the dressing style. Every state in India promotes different attire and each one of them looks traditional as well as trendy. For instance, Gujarat promotes Patola and Rajasthan represents the land of Bandhani sarees. Saree is the most prevalent attire that is adorned by most of the women in this country. It is the sheer beauty of this garment that tends to entice the minds of many women. Saree has its own class and it looks amazing on any woman, irrespective of her age, complexion and standard of living. Although modernization has its impact on the people residing in India, the beauty of saree can never be ignored. It appears to be both tasteful and expressive. When it comes to admiring the beauty of every Indian woman, the importance of saree can never be ruled out. The glorious nine yards has the power to make the wearer look completely different, in a good way, of course. If you have been thinking of giving your style of clothing a change then saree could be an amazing option. It is indeed classy. There have been several people who complain about their sarees for being uncomfortable. Well, they simply need to choose the appropriate ones. There is no dearth of designs, textures, fabric and patterns in a saree. Depending upon the weather conditions, occasion and mood, one needs to wear a saree. If in case you are on a self-determined mission to wear all the popular and classy sarees that India as a country has to offer then you are about to experience something great. The best way of accomplishing your saree mission is by means of purchasing every state’s favorite saree from either the individual states or from a reputed saree store that gives you 100% genuine sarees. In today’s world, it is indeed hard to find such stores where you can completely rely on the materials offered. In such situations, you can surely look ahead to visiting Indian Silk House Exclusives that guarantees you with great quality and genuineness. This store also caters to its online customers throughout the world. Hence, if you intend to buy sarees online then this is surely the best place. 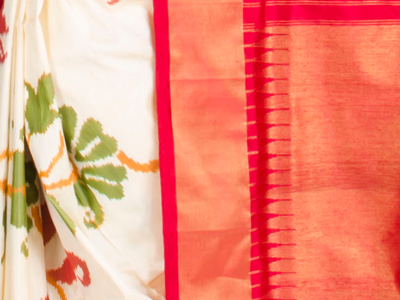 There are several wondrous saree varieties available in Indian Silk House Exclusives. For instance, if you want to buy an original Patola then you will be offered with the splendor of a genuine Patola coming straight from the land of Gujarat. It is known to everybody that Gujarat represents the land where the families of skilled master weavers of the ever so glamorous Patola of Gujarat dwell in. It takes more than two months to create one Patola. The double Ikkat Patola is heavily designed and in order to keep up with the proposed design, it is important to use a wide variety of warp and weft silk threads. These threads are separately tied with separate cotton threads. The family of weavers mainly uses the tie and dye technique. In this process, the tied portion mainly works as a resistant against the catching of color to the threads. The toughest task is to entrust someone with the task of repeatedly tying and opening each knot whenever different colors are applied. The dyed material is used to create bobbins and the threads are usually wounded in such a way so that an emerging as well as interesting pattern is created. The process is quite complicated and this is why an old fashioned harness loom is put to use while creating a majestic Patola saree. The loom must dip at an angle where the left side is lower than the right one. In order to give shape to an idea, it is better not to make frequent changes while the warp and weft are in progress. There are several complicated and interlinked processes involved in the weaving of Patola and thereby the skilled weavers are required to stay alert at every single stage. 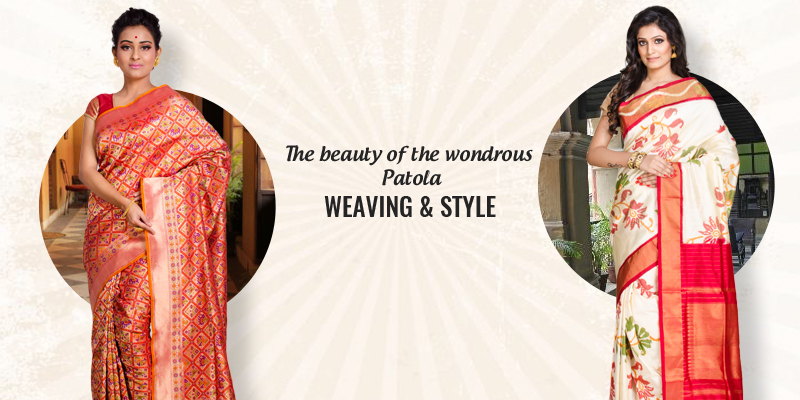 Patola is surely one of the greatest as well as finest instances of skilful craftsmanship and creative finesse. This is a classic output that is based upon the cumulative experiences of a number of generations. A genuine Patola can cost you even a lakh. It is always better to opt out for a perfect place that does not compromise with the quality and always provide its customers with only the best in the market. Indian Silk House Exclusives is surely one of the finest stores in India that caters to both its online and offline customers with same warmth and diligence.